Whoever decided on the design of the Topps 1978 cards probably began to get a sinking feeling upon the realization that the defining characteristic of the cards, the cursive script used for the name of each player’s team in the lower left-hand corner of his card, mimicked the lettering scrawled across the chests of the 1978 Atlanta Braves. The block lettering that was usually used on baseball cards, though in and of itself without any particular life or charm, contributed to a kind of seriousness and legitimacy that is somehow punctured in the 1978 cards by the flaccid twirling and curlicues of the mechanized cursive in the lower left corner. If I found this card at the top of my first pack of 1978 cards, and I hadn’t already known of Gary Matthews, at least insofar as he was in my mind also his once and future teammate Garry Maddox, I might have wondered if by mistake I had purchased a novelty production of cards for some local factory team that once a week sweated out their hangovers by playing a double-header against some visiting fellow yokels down at the high school field. But it wasn’t Gary Matthews’ fault that he landed on a flimsily legitimate baseball card in the ill-conceived uniform of a team on the very edge of the major leagues. For his part, the former Rookie of the Year and future National League Championship Series MVP was a veritable prototype of solidity, almost guaranteed throughout his 16-year career to post good but not great numbers in home runs, runs scored, RBI, on-base percentage, slugging percentage, and steals. In the 1978 season he would be the Braves’ second-most productive hitter, after Jeff Burroughs, with a prototypical Matthewsian 18-homer, .285 batting average campaign. If you put Matthews on a team with a few more good players, which as it turned out was exactly what happened in 1981, when the Braves traded him to the Phillies for Bob Walk, the team would win games. 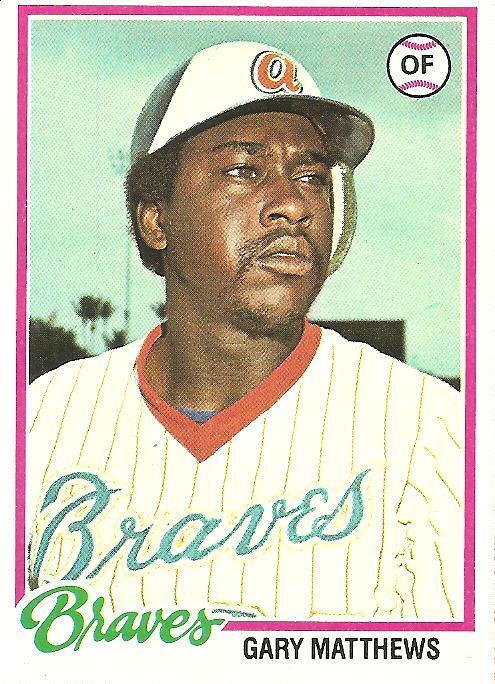 On the 1978 Braves, however, solid efforts like those of Gary Matthews, and perhaps any kind of solidity, were absorbed without effect into the story of the team, a tale with no more lasting purchase on the world than a name written in loopy yellow cursive in the snow. You are currently browsing the archives for the Gary Matthews category.